The Maverik Center was on fire for the Pac-12 Women’s Gymnastics Championship on Saturday night. 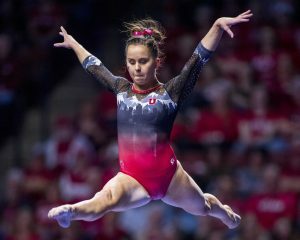 Unfortunately, the University of Utah Red Rocks gymnastics team fell to rival UCLA in a meet for the ages. UCLA and Utah finished in first and second with final scores of 198.225-198.025, respectively. Oregon State came in third (196.600) and Cal rounded out the second session schools with a score of 196.575. Despite this loss, the Utes set new season and career highs individually and as a team. University of Utah women’s gymnastics junior Missy Reinstadtler performs on the uneven bars in the PAC 12 conference championship at the Maverik Center in Salt Lake City, Utah on Saturday, March 23, 2019. 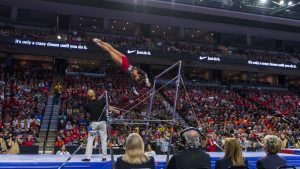 The Red Rocks started off the competition on the bars, and the team was not going to let what happened in Athens last week take their eyes off the prize. Kari Lee started things off with a nice routine that scored a 9.850, from there the team put the pedal to the metal. Both Hunter Dula and Kim Tessen set career highs on the event. Dula’s score of a 9.900 and Tessen’s 9.925 helped Utah to distance themselves from UCLA. MaKenna Merrell-Giles and Missy Reinstadtler added a pair of 9.900’s to the score sheet and coming out of the anchor spot was MyKayla Skinner, who was fired up and scored a 9.95. The Utes score of 49.575 was not only enough to set a new team high on the event for this season but also put them into first place. UCLA was close behind scoring 49.425 on vault, in third was Cal coming off a solid floor set (49.175) and Oregon State who had a rough start on beam scoring 48.600. The Red Rocks then took to the beam, which even though they’ve shown signs of improvement in the last few weeks, was still the team’s weakest event. 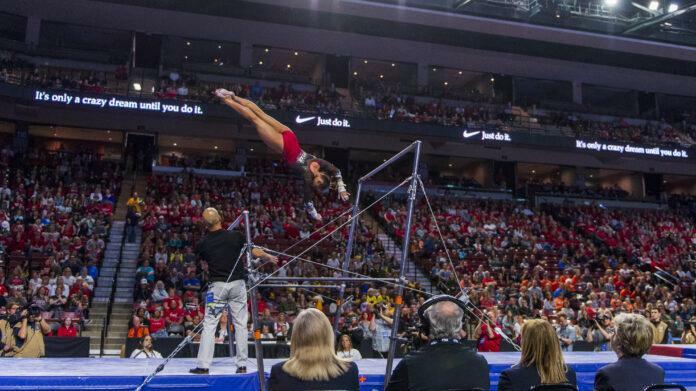 Meanwhile, UCLA was on bars and saw yet another perfect 10 go to Kyla Ross. This score was enough to put UCLA in the lead. Utah trailed UCLA 99.075-98.875 heading into the third rotation. The Red Rocks needed a huge floor set to be able to close the growing gap, and they delivered. The team had only two scores lower than 9.90 on the event when everything was said and done (Randall, 9.850 and Soloski 9.875.) Lee contributed a 9.925, while Roberts and Merrell-Giles added a pair of 9.950’s to the sheet. Lee’s score ties her career best while Robert’s sets a new career best. 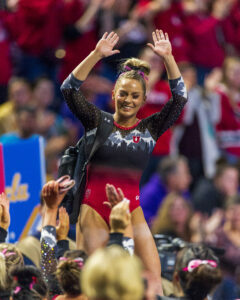 Utah fans all held their breath as MyKayla Skinner took to the floor. 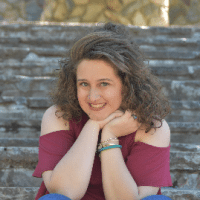 Skinner had been looking for a perfect score all season and wasn’t going to be satisfied until she got it. And boy did she get it. When Skinner finished her routine, the entire arena burst out with cheers and chants for 10’s. When the scorecard revealed she had finally done it, Skinner got emotional. “I went out there and did it. That was really special,” Skinner said. Co-head coach Tom Farden said that Skinner was in her element and it showed. University of Utah women’s gymnastics junior MyKayla Skinner reacts to her perfect 10 after her performance on the floor in the PAC 12 conference championship at the Maverik Center in Salt Lake City, Utah on Saturday, March 23, 2019. “That 10 was well deserved and a long time coming,” he said. The team’s overall score of 49.700 also set a season-high score on the event. Heading to the final rotation, Utah had cut the lead and was within striking distance 148.575-148.625. The last rotation proved to be the one that would determine who would win as both Utah and UCLA took to their best events. Lee seemed to take the momentum that Skinner had gotten from the floor and applied it to the vault where she scored a 9.900. From there the scores took a slight dip as well as a pair of 10’s were given out to UCLA’s Ross and Katelyn Ohashi. Skinner wasn’t going to give up that easily and with her final event of the night scored a 9.950. It wasn’t enough though as the Red Rocks fell to UCLA 198.225-198.025. Oregon State came in third with a score of 196.600 and Cal took fourth (196.575.) This is not only a season-high for both teams but also the two scores were the highest scores across the nation this weekend. Skinner ended in second place in the All Around, a mere 0.05 points behind Kyla Ross. Merrell-Giles took third in the same category. Skinner also took home some individual hardware. She was named co-champion on the floor with Ross and Ohashi and was declared co-champion on the vault. While the regular season might be done, the postseason is just getting started. The team will find out where they are headed for the NCAA Regional Competition on Monday, March 25.